The 275 GTB was a two-seat gran turismo automobile with a displacemet of 275 cc per cylin-der. Four 275 GTB Competizione Speciales were built in1965, each fitted with a 250LM engine. Its entire body was made of thin aluminium, and the chassis was built of magnisium and steel perorated with holes all over. At one point in time, the light weight of the Speciales posed a problem, and the FIA refused to homologate the model as a GT contender. This underweight issue was dismissed only after Enzo Ferrari threatened to abandon the motor sport altoge-ther, and a compromised was subsequetly reached. A series II version of the 275 GTB appeared in 1966. 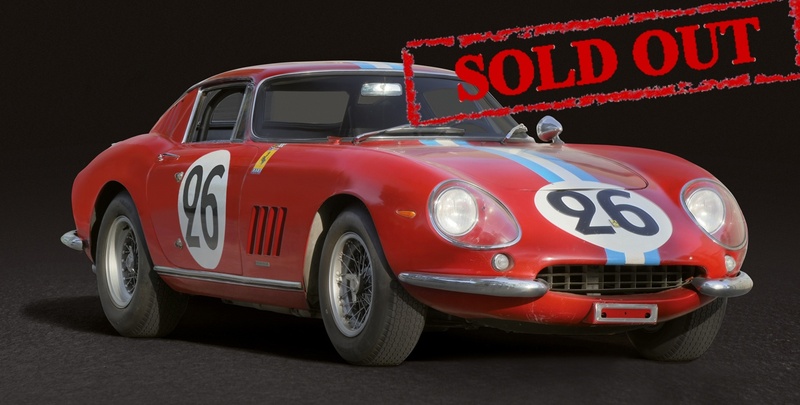 It was known as 275 GTB/C, where C stands for “Competizione.“ A total of twelve 275 GTB/Cs were constructed and equipped either with a two-cam or four-cam engine. Suspension was made stiffer by extra springs. The body was mounted on a super-lighteight chassis and covered by ultra thin aluminium panels that were half as thick as the ones used on the 275 GTB. Even leaning on a 275 GTB/C would dent its bo-dy. The entire rear section was reinforced by fiberglass to prevent it from flexing. Many parts were cast in magnisium to save weight. Due to a clerical error that confined the 275 GTB/C to a three “carb“ engine, the GTB/Cs had to use three Weber 40DF13 instead of six 38DCN carbu-rettors, which impacted its power output. CMC had the rare opportunity to document in detail the GTB/C #09015 in its original conditi-on. The car is the second Competizione produced from series II and one of the last GT class cars built by the racing department at Maranelo. As is the case with most 275 GTB/Cs, #09015 saw some serious track use. Throughout its racing career, the 275 GTB/C model type racked up quite a number of victories.